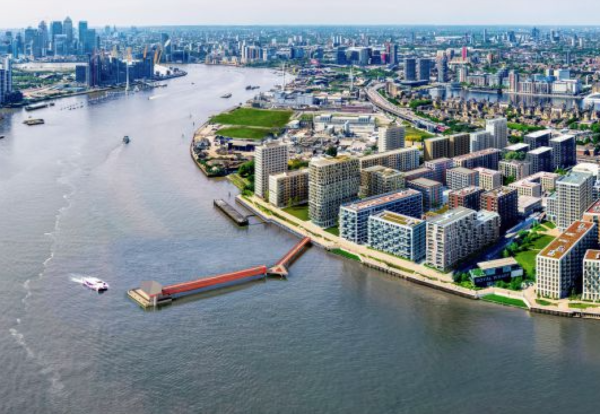 McLaughlin & Harvey has secured the £7m contract to build the longest pier on the Thames for river ferry services to developer Ballymore’s Royal Wharf residential scheme in East London. The firm has demolished an existing derelict jetty at the site and piling specialist CMP Thames will start piling the first of two river anchor points next week. These will support two bridges between a triangular viewing platform halfway along the pier and the river ferry terminal. Designed by London-based architects Nex, Royal Wharf Pier is being funded by the housing development and will be used by the Thames Clippers riverboat service from later this year. The 130m ferry pier just south of City Airport as part of a £3.5bn regeneration area.